Wen I opened the box, I found equally impressive products inside. The photo above demonstrates the branding that Blissful Bath goes through. Notice the similar font and color on all the products, except the specialty Happy Birthday Cake. Lesson two: If you have a brand strategy, work it! I was a little surprised to see that there were no ingredients listings on any of the products. In terms of reselling the exquisite goodies in stores, ingredient listings are a must. I phoned and chatted with the store and the very friendly happy gal that answered the phone said that they wholesale to stores. So, I’m waiting for a phone call from Lee Anne, the owner, to just chat about how they’re getting around the ingredient listing thing. The ingredients are on the web site, easy to find, for anyone that is worried about allergies or just plain curious about formulations. Having just gone through a painful and long re-do on 156 labels that we’re working on (all because we forgot spaces for UPC codes – rookie mistake! duh! ), I hope that Blissful Bath doesn’t end up redoing their labels at some point down the road. So far, I’ve used the Butter Bath Bomb and the Shower Butter. I was delighted with the Butter Bath Bomb, finding it to be the perfect amount of moisturizing without leaving me or the tub sticky and oily. The scent was lovely and the bath fizzy lasted quite some time. I was pleasantly surprised when it kept fizzing and fizzing for several minutes! The Shower Butter is a basic lotion bar with the instructions to rub on damp skin. I was pretty excited with this idea, imagining that Blissful Bath’s savvy creators had managed to put an emulsifier in the Shower Butter to make it turn into a lotion on my damp skin. Alas, the butter was not happy with the fact that I was still damp and just sort of scootched on my skin and beaded up in an unattractive manner. Sadly, oil and water still don’t mix. So, I toweled off and proceeded to rub myself all over with the Black Raspberry Martini and am now happily dry and moisturized and smellin’ fine. I’ve left the best to last. These little happy confectionery creations are amazing little bubbles of joy and happiness. I am so bummed that I don’t have any friends with a birthday coming up! I want an excuse, any excuse, to give someone the adorable Happy Birthday Cake! This clever little feat is done with: soluble dextrose, colorant and candy sprinkles. I tasted the frosting and forced my younger brother at Otion, to do the same (much to his dismay and confusion) and the frosting tastes somewhat sweet. Since dextrose is a form of sugar, this makes complete sense. I am so impressed with the artistry and presentation of the little Cakes. The amount of work it would take to do this extra step is well worth the $5 for this mini-bomb, with the frosting, complete with the little flag. 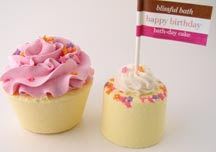 Based on my very positive experience with Blissful Bath, I would highly recommend them for any gifts you need to give or for a little respite for yourself. 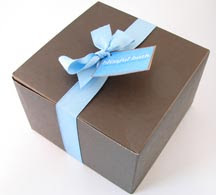 Their products are crafted with care and the the packaging just puts the extra special touch on their goodies. If you’re in MN, you should stop by their store. I’m jealous. I wish I could. If you do, please be sure to take photos and let me know what you thought! 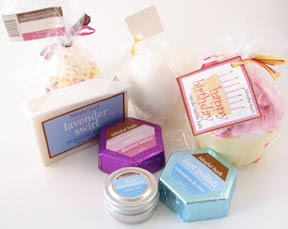 I live nearby Blissful Bath and have been to their store and agree their products are great!